The WCG is a volunteer organization based in Weston, MA helping to raise awareness of the climate crisis and influence behavior that will impact our community and the world. Which municipalities and locations within the United States contribute the most to household greenhouse gas emissions, and what is the effect of population density and suburbanization on emissions? 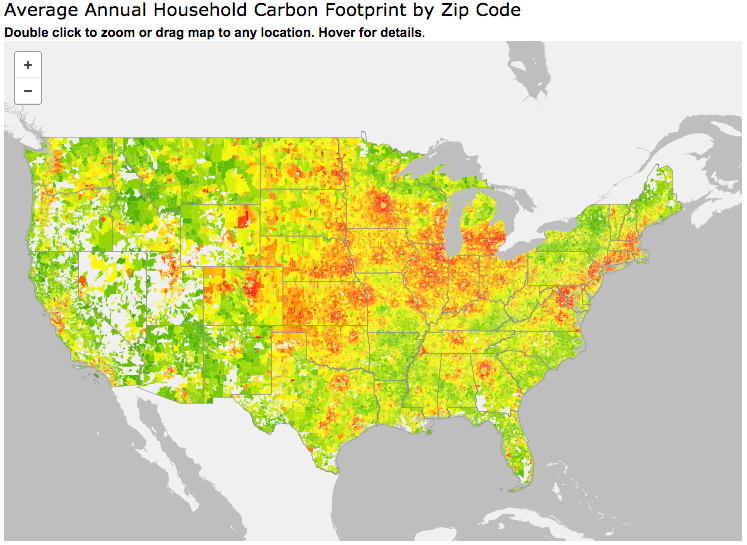 Using national household surveys, we developed econometric models of demand for energy, transportation, food, goods, and services that were used to derive average household carbon footprints (HCF) for U.S. zip codes, cities, counties, and metropolitan areas. We find consistently lower HCF in urban core cities (40 tCO2e) and higher carbon footprints in outlying suburbs (50 tCO2e), with a range from 25 to >80 tCO2e in the 50 largest metropolitan areas. Population density exhibits a weak but positive correlation with HCF until a density threshold is met, after which range, mean, and standard deviation of HCF decline. While population density contributes to relatively low HCF in the central cities of large metropolitan areas, the more extensive suburbanization in these regions contributes to an overall net increase in HCF compared to smaller metropolitan areas. Suburbs alone account for 50% of total U.S. HCF. Differences in the size, composition, and location of household carbon footprints suggest the need for tailoring of greenhouse gas mitigation efforts to different populations. Weston Media Center was on-hand to video Willie O'Laughlin's June 23rd talk on the Belo Monte Dam and other projects impacting the Amazon Rainforest. We are posting the video here for your convenience, but you can also find it on the Weston Media Center's Vimeo Channel (see links below). Damming the Amazon Rainforest 2014 from Weston Media Center Inc. on Vimeo. You can email the WCG at westonclimategroup(at)hotmail.com or by clicking here. To join the WCG GoogleGroup listserv, click here.